Chamba, the land of lord Shiva is famous for its untouched natural beauty. 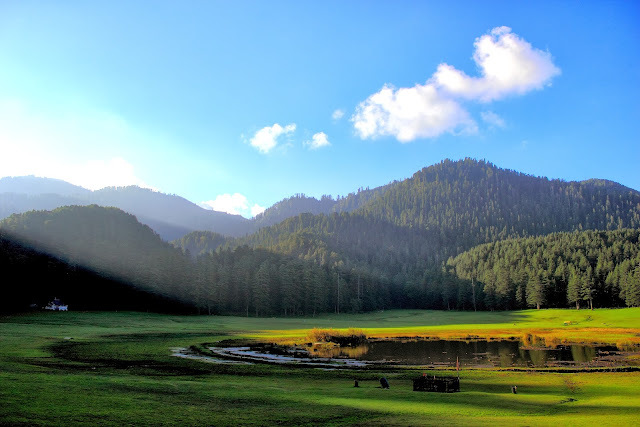 The district has Dalhousie, Khajjiar, Pangi and Bharmour as main tourist destinations.The place, located amidst picturesque and verdant valleys, is visited by tourist round the year. Sub-Himalayan range of mountains, full of diverse flora and fauna, make Chamba an exhilarating experience. Khajjiar is a lovely hill station in the Chamba district of Himachal Pradesh. It is located at the foothills of the Dhauladhar mountain ranges of Himalayas. Notably, this is one of the very few places on the globe that boast of 3 different ecosystems in one single place-lake, pasture and forest. The place derived its name from its ancient idol called Khajji Naag, which is still revered highly and worshipped by the local people.